Here appear occasional jottings of my random musings. Profound or jejune, they reveal the contours of my mental universe, with world history, intellectual history, civilizations, philosophy, religion, society, knowledge, and books as some major themes. Being a native of the prominent Singapura (Singapore, from Sanskrit सिंहपुर, siṃha (सिंह) meaning "lion", pura (पुर) meaning "city") , I was surprised to learn only recently that there was yet another, earlier and much more obscure, Simhapura (also from Sanskrit, meaning "lion city") in Southeast Asia. I dare say not one in a million in Singapore knows about this. Simhapura was, from the 4th to the 8th century, the capitol of Champa, an Indianized kingdom that at its peak, from the later 7th to the 10th century, controlled what is now southern and central Vietnam, and was known to the Chinese at various times as 占婆国, 林邑, 环王国, 占城. (Wikipedia, Lonely Planet). Simhapura is now Trà Kiệu, a village (in Duy Xuyên, Quảng Nam Province, Vietnam) through which I passed recently. On September 12, the day after the attacks on the US diplomatic missions in Egypt and Libya, the New York Times set out to explain what it called the "anguished relationship between the United States and the Muslim world". According to the Times, the "Muslim world" was prone to outbursts of violence, and the reaction to the 14-minute anti-Islam movie trailer The Innocence of Muslims was both baffling and predictable. "Once again, Muslims were furious," wrote reporter Robert F Worth, "and many in the West found themselves asking why Islam seems to routinely answer such desecrations with violence." Other media outlets echoed the claim that "the Muslim world" was consumed by anger, and had long been so. The Associated Press offered a look back at "Five other incidents that inspired rage in the Muslim world", crediting over a billion people for the actions of a few thousand in their search for historical continuity. Others took a psychoanalytic approach. "Why is the Muslim world so easily offended?" asked Washington Post columnist Fouad Ajami. "Madness in the Muslim World: Help Me Understand," pleaded a blogger for the Houston Chronicle. It is time to retire the phrase "the Muslim world" from the Western media. Using the phrase in the manner above disregards not only history and politics, but accurate reporting of contemporary events. The protests that took place around the world ranged in scale and intensity, in the participants' willingness to use violence, and in their rationales. The majority of the "Muslim world" did not participate in these protests, nor did all of the Muslims who protested the video advocate the bloodshed that took place in Libya. By reducing a complex set of causes and conflicts to the rage of an amorphous mass, the Western media reinforce the very stereotype of a united, violent "Muslim world" that both the makers of the anti-Islam video and the Islamist instigators of the violence perpetuate. Essentialist views of Islam and Muslims are nothing new. In Western media, Islam is often presented as a contagion, with Muslims as the afflicted, helpless to their own hostile impulses. What is different about the current crisis is that it comes in the aftermath of the "Arab Spring" - another series of intricate events depicted as interconnected and inevitable. Democracy would "spread" from one Muslim country to another, analysts argued, regardless of the unique historical trajectories of individual states. Some analysts went so far as to suggest it would spread to Central Asia, a region of largely isolationist dictatorships uninfluenced by Middle Eastern politics. The current protests are being portrayed as an "Arab Winter" - a simplistic reversal of a simplistic perception of success, with Muslims, undifferentiated, receiving the blame. There is, of course, cohesion among Muslims, in the sense that there is cohesion among followers of any faith. The notion of the ummah is an essential part of Islamic doctrine. But the way the idea of "the Muslim world" is expressed within Islamic communities is different from the way it is expressed outside them. It is rare to hear the phrase "the Christian world" used in the English-language media, because doing so would generalise about the motives of over 2 billion people. No such respect applies to the world's 1.5 billion Muslims. Googling the phrase "the Christian world" yields 5.8 million results, while the phrase "the Muslim world" gives over 87 million results, many of them wondering what is "wrong" with the queried target. When the phrase "the Muslim world" is invoked, it is usually to reduce, denigrate or impugn. The Western media's broad-stroke regionalism means that conflicts within individual Muslim-majority states become marginalised. Syrians posting on Twitter wondered how the world could give so much attention to a conflict that killed seven people while dozens of Syrians are killed by state security forces every day - documenting, as one commenter noted, their own demise in videos that receive far less attention than the bigoted pseudo-cinema of one American. Similarly, the violence at the diplomatic missions in Cairo and Benghazi was initially conflated, with "Muslim rage" being presented as a root cause for two distinct conflicts. The tendency to see "the Muslim world" as a problem in general means that specific problems within Muslim countries go unseen. Soon after the destruction of the US embassy in Benghazi and the deaths of four Americans, a protest was held against the men who murdered them. Libyan citizens held English-language signs declaring "Benghazi is against terrorism" and "Sorry Americans this is not the behavior of our Islam and Profit [sic]". Photos of the protest, distributed by Libya Alhurra Livestream, went viral on Facebook and Twitter. The Libyans protesting were aware that not only Libyans, but Muslims in general, would be blamed for the violence that took place, because the small group of Muslims who stormed the embassy would be seen as representative of all. They gave the rare apology that Western commentators often encourage Muslims to make on behalf of others who commit violence in the name of Islam. But while the sentiment of the protestors is appreciated by many Americans - and the photos likely assuaged some prejudices - such explanations should not be necessary. Ordinary people should not be assumed to share the beliefs of violent criminals who share their faith. The Innocence of Muslims was made by Nakoula Basseley Nakoula, an Egyptian-American who hates Muslims. It was found on YouTube and put on Egyptian television by Sheikh Khaled Abdullah, a man trying to convince the world that Americans hate Muslims. This was a perfect storm of gross and deceitful parties depicting each other in the most vile terms, and then living up to each others' worst expectations. The answer to such invective is not to reinforce it through media portrayals of "Muslims" as a collective. The media should instead pay more attention to individual states, conflicts and leaders, since dictatorship and factionalism have been as essential in shaping politics in Muslim-majority regions as has religion. The current crisis demonstrates how corrupt parties use religion as an incitement to violence and a means to political gain. The Western media should not play party to their prejudices. Sarah Kendzior is an anthropologist who recently received her PhD from Washington University in St Louis. According to a 2011 study by the Centers for Disease Control and Prevention in the U.S., the gap in life expectancy at age 25, by education, actually widened between 1996 and 2006 for both men and women with a bachelor’s degree or higher. Middle-class professionals such as doctors and accountants are outliving builders and cleaners by as much as eight years, according to official figures. People from all social classes are living longer, data from the Office for National Statistics showed yesterday, but variations in the age at which people are dying indicate Government measures to reduce the gap between rich and poor have failed. The study looked at people from five social classes in 1972-76 and 2002-05. Skilled workers have had a greater increase in life expectancy at birth and at the age of 65 than those in manual occupations, the researchers found. Men in professional occupations can expect to live to 80, almost eight years longer than those in unskilled jobs, whose life expectancy is 72.7. Professional women have a life expectancy at birth of 85.1 years, compared with 78.1 for manual workers. Men in managerial and technical occupations such as journalists and teachers have slightly shorter life expectancy at 79.4, while unskilled workers such as labourers and cleaners have the shortest life expectancy. The King's Fund, a health think tank, said the figures showed the differences between social groups were growing. Karen Jochelson, a research fellow, said: "Those who have a lower life expectancy have it because of a range of factors. "They may live in housing which is damp and has poor heating, or near busy roads which means more air pollution. "But the nature of people's jobs also has an effect. If you have autonomy and control over what you do, you tend to be in better health. "There is also evidence that shows people on low incomes have higher smoking rates and their diets tend to be worse because high fat, high sugar diets are cheaper." Andrew Lansley, the shadow health secretary, said: "If we are going to tackle poor health outcomes in the most deprived areas and among the poorest sections of society, we must ensure that public health resources and the actions of government are focused on this and not simply the treatment of disease." Other experts said there would be problems if the poor failed to catch up with the rich. The less affluent started to give up smoking in the 1970s, two decades later than their richer neighbours, and the health improvements seen by this change take about 30 years to materialise. "If we don't start seeing changes as a result of this, then there are other factors at play," said Danny Dorling, professor of human geography at Sheffield University. One factor is that the rich can effectively buy longer lives through more regular holidays and leisure activities. The original Whitehall Study investigated social determinants of health, specifically the cardiorespiratory disease prevalence and mortality rates among British male civil servants between the ages of 20 and 64. The initial prospective cohort study, the Whitehall I Study, examined over 18,000 male civil servants, and was conducted over a period of ten years, beginning in 1967. A second cohort study, the Whitehall II Study, examined the health of 10,308 civil servants aged 35 to 55, of whom two thirds were men and one third women. A long-term follow-up of study subjects from the first two phases is ongoing. The Whitehall cohort studies found a strong association between grade levels of civil servant employment and mortality rates from a range of causes. Men in the lowest grade (messengers, doorkeepers, etc.) had a mortality rate three times higher than that of men in the highest grade (administrators). By design, the Whitehall studies have been focused upon a single set of related occupations, where the people within each occupational grade tend to be socially similar, yet clear social distinctions between grades are inherent. The studies were designed in this manner as an attempt to avoid certain research drawbacks associated with generalized social class groupings—drawbacks that otherwise would result from the diversity of occupations within social classes—which in turn would tend to reduce the objectivity of any analysis. The primary health risks under investigation in the Whitehall studies include cardiovascular function, smoking, car ownership, angina, leisure and hobbies, ECG measurements, and diabetes. High blood pressure at work was associated with greater "job stress," including "lack of skill utilization," "tension," and "lack of clarity" in tasks assigned. The higher blood pressure among the lowest grade servants was found to be related to the highest job stress score, whereas blood pressure at home was not related to job stress level. According to Whitehall study researchers, "a steep inverse association between social class, as assessed by grade of employment, and mortality from a wide range of diseases" has been demonstrated. Summing up the moral of the Whitehall studies, the researchers concluded that "more attention should be paid to the social environments, job design, and the consequences of income inequality". 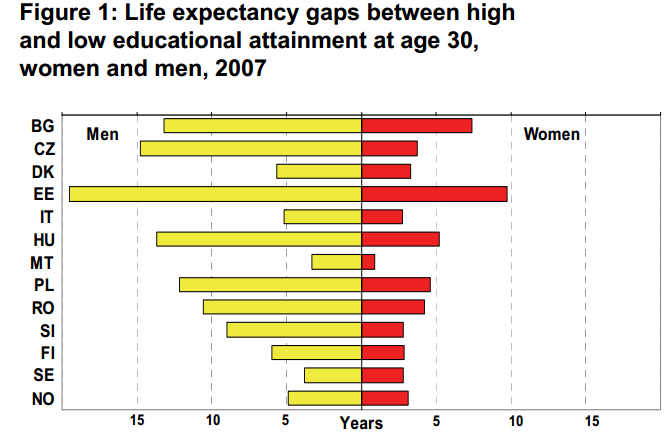 Life expectancy by educational attainment is a very important indicator of socio-economic inequalities in health. Based on the available data for a selection of EU Member States and Norway, a systematic relationship between educational attainment and mortality can be observed: at any age, life expectancy is less among persons with the lowest educational attainment and increases with educational level. 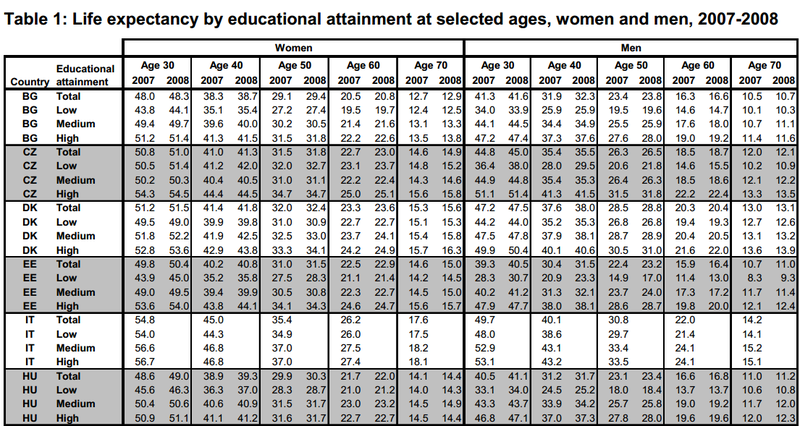 Large differences in life expectancy by educational attainment can be observed among Member States. Moreover, these differences are more pronounced for men than for women. Country names are abbreviated as follows: Bulgaria (BG), Czech Republic (CZ), Denmark (DK), Estonia (EE), Italy (IT), Hungary (HU), Malta (MT), Poland (PL), Romania (RO), Slovenia (SI), Finland (FI), Sweden (SE), and Norway (NO). Life expectancy at age x: is the average number of years a person would live beyond age x if current age specific mortality rates were to remain the same. 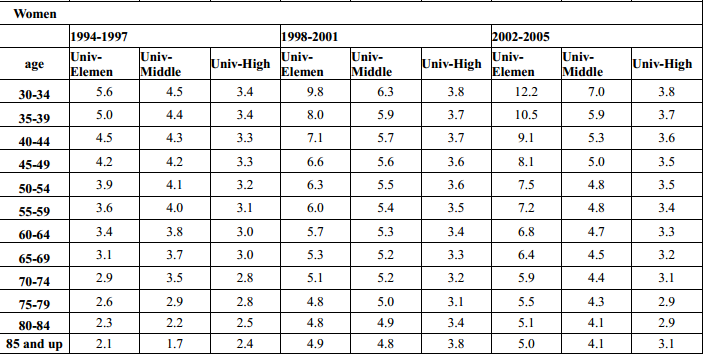 • High corresponds to tertiary education (ISCED levels 5 and 6). Educational attainment level is used in this publication as a proxy for socio-economic status. School of Public Health, Seoul National University, Seoul, Korea. Objectives: To examine social inequalities in life expectancy during the transition period of the Korean economic crisis. Methods: Data from the census and national deaths in the National Statistics Office in Korea. Life expectancy estimates were calculated by age, gender, and educational attainment for three time periods: 1994-1997, 1998-2001, 2002-2005. Absolute differences in life expectancy by educational attainment were utilized as a proxy measure of social inequality. Findings: Those with less education experienced a shorter life expectancy at each age than their counterparts with higher levels of education attainment. At age 30, university-educated men experienced life expectancy 15.4 years (1994-1997), 17.9 years (1998-2001) and 19.2 years (2002-2005) higher than those elementary or less-educated counterparts did. 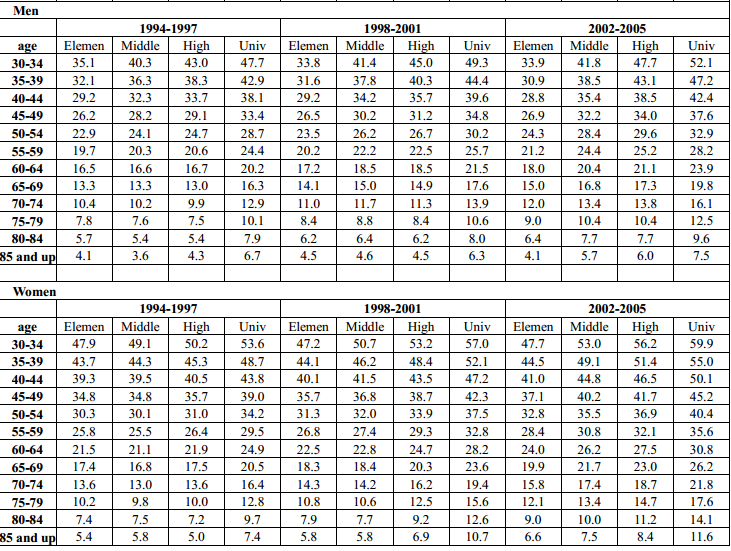 For women, the corresponding differences by each period were 8.8 years, 10.0 years and 18.8 years. Widening social inequalities in life expectancy are evident during the transitional period of the Korean financial economic crisis, 1994-2005. Conclusions: This study evinces that the widening gap of social inequalities in life expectancy is closely related to the widening gap of social inequalities in Korea following a macroeconomic crisis. considerably increases life expectancy for all age intervals, although some exceptions exist. 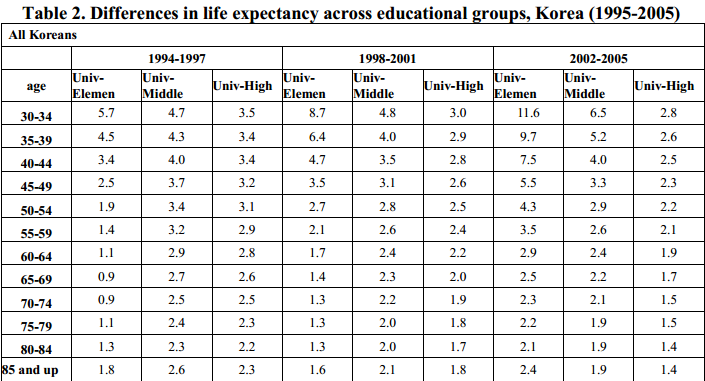 effect of education on life expectancy become much clearer after the economic crisis. Table 2 is derived from Table 1. 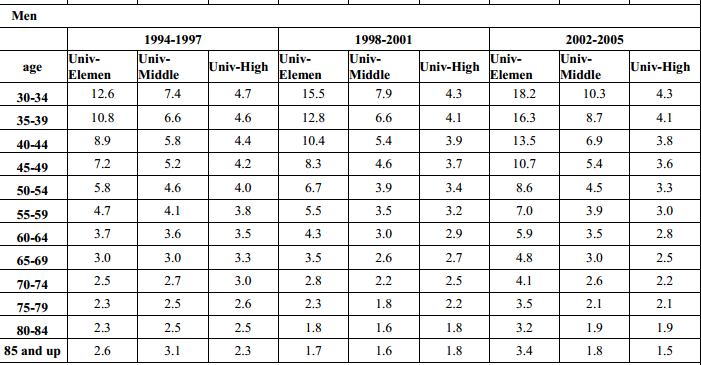 "Univ-Elemen" = (the value for "Univ") - (the value for "Elemen") in Table 1.
life of the least educated Koreans. and the less educated than for men and the highly educated. Academic Ranking of World Universities (ARWU) 2012 (here) focuses exclusively on the universities' research strength, and publishes the top 500 universities by research strength in the world. Amongst these 500, 22 are in mainland China (excluding Hong Kong). * Institutions within the same rank range are listed alphabetically. The above rankings are global in scope, permitting international comparison.